jrs12 180 3.7 3.7 English Male No 2008 Accepted Withdrew. Invited to apply for scholarship. DeweyDell 177 3.6 3.6 Accepted Sticky green. Bennettju 172 3.4 3.5 Theology Male No MA 2010 Waitlisted Withdrew. Excellence = a Habit 171 3.7 3.7 Double major in humanities No 2011 Accepted Offered $75K over 3 years. Given the COA, this is equivalent to just $4K more than Michigan offered. acdisagod 171 3.6 3.6 Political Science Accepted Attending! direwolf 170 3.9 3.9 Political Science Male No CA 2010 Accepted Withdrew. normalien 170 3.5 3.5 Philosophy Male No 2008 Accepted Attending. Also accepted to JD/Master en droit dual degree program at the University of Paris I Pantheon-Sorbonne. theothercat 169 4.0 Female No NE Rejected Complete your interviews, y'all! Anti09 169 3.7 3.7 Economics Male No NY 2011 Accepted Applied EA, deferred to general admission. Accepted. goobot 169 3.7 3.6 Male No CA 2008 Accepted Going. Hell yeah. tigerbunny 169 3.5 3.6 International Studies (Development Cooperation) Female International 2010 Waitlisted then accepted 95% sure I'll attend. NYCbound35 169 2.9 Biology Male No NY 2011 Rejected Hail, all hail our alma mater. kpormir 168 4.0 4.0 Psychology Male No CA 2014 Applied Interview Request 1/6. Withdrawn - Wasn't a huge fan of the interview setup, so I opted not to do it. shadu 168 3.4 3.5 Male No 2010 Applied I withdrew after being placed on reserve. UFMatt 168 3.4 3.3 Microbiology Male No 2010 Waitlisted Deferred from EA, never heard back, so will leave as WL (I withdrew). Settler 167 3.8 3.8 Female No 2010 Accepted Via email. zenithtonadir 167 3.8 3.8 English, Psychology Female FL Accepted via e-mail 2/16!! mah 167 3.8 3.8 Info & Comp Sci Male No CA 2010 Applied Deferred to regular applicant pool. Reukai 167 3.4 3.5 General Biology Female No CA 2011 Applied Rejection is most likely course of action. britrf 167 3.4 3.4 Female No 2013 Waitlisted On reserve. LittleJenn 166 3.8 3.8 No Accepted Wow! Yay! monkeygirl 166 4.0 3.7 Political Science and Special Honors Female Yes NY 2010 Applied deferred to RD 12/14/09 Ithaca not-so-gorges to me! nick_scheu 166 3.8 3.5 Political Science Male No CA 2012 Waitlisted Placed on reserve list. Pyke 166 3.5 3.5 B.Comm Male No International 2008 Waitlisted then rejected Technically deferred then rejected. jar89 166 3.4 3.4 Pure Mathematics, Economics Male Yes Domestic 2015 Accepted Complete 1/11. Interview requested 2/12. Accepted 3/18 via phone. Jason321123 164 3.7 3.7 English and History Male Yes TX 2010 Applied This is weird...they didn't outright reject me but put me on a waitlist and then told me to transfer after my first year...they "strongly encourage" it? ash8309 163 3.1 Double: Journalism and International Studies Female Domestic 2011 Waitlisted Placed on reserve 3/29. Moriarty 161 3.4 Female Yes Domestic 2012 Accepted Reach successful! vjm 158 3.7 3.4 Interdisciplinary Studies Female No VA 2007 Rejected Dinged after an excruciatingly long wait. No surprise. Callous135 158 3.3 3.3 Political Science Male Yes CA 2012 Waitlisted Also an unpredicted decision! theilluminati 158 3.4 Political Science and Economics Yes Waitlisted Deferred, then reserved. POSERmyLOVE 156 3.7 3.7 Latin american studies / Spanish Female Yes 2011 Accepted yay! mikealao 156 3.2 3.0 Accounting Male Yes OH 2011 Waitlisted then rejected I doubt that I will make it in, but they sent an application fee waiver. Waitlisted. 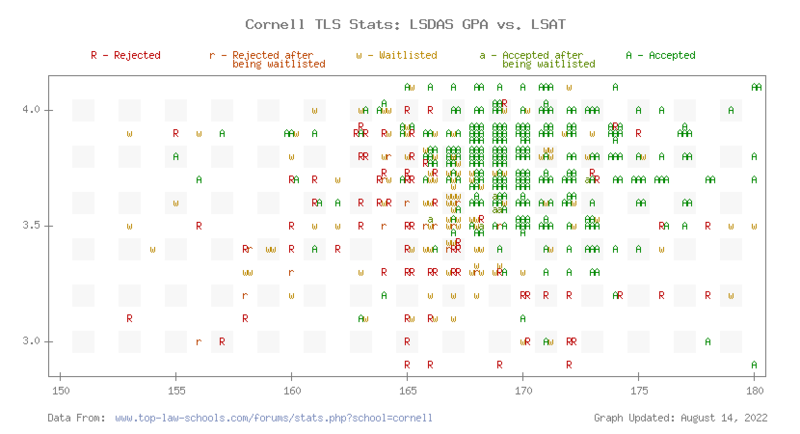 Be sure to check out the TLS Profile on Cornell Law.